We are pleased to announce that Sara Wyn Kane, a partner at Valli Kane & Vagnini LLP has been selected for the 2018 New York Metro Super Lawyers list. This is an exclusive list, recognizing no more than five percent of attorneys in the State of New York. Associate Monica Hincken has also been selected for the 2018 Rising Star list. Super Lawyers, part of Thomson Reuters, is a research-driven, peer influenced rating service of lawyers who have attained a high degree of peer recognition and professional achievement. To ensure a credible and relevant annual list, attorneys are selected from more than 70 practice areas and all firm sizes. The objective of Super Lawyers is to create a credible, comprehensive, and diverse listing of exceptional attorneys to be used as a resource for both referring attorneys and consumers seeking legal counsel. New York Metro Top Women Super Lawyers supplement in The New York Times on Sunday, March 24, 2019. 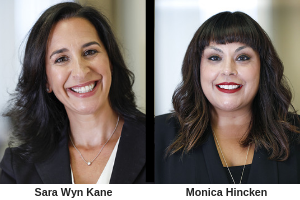 Please join us in congratulating Sara Wyn Kane and Monica Hincken on their selections. For more information go to SuperLawyers.com.